But look: votes can be counted, and what can be counted is Quant territory. 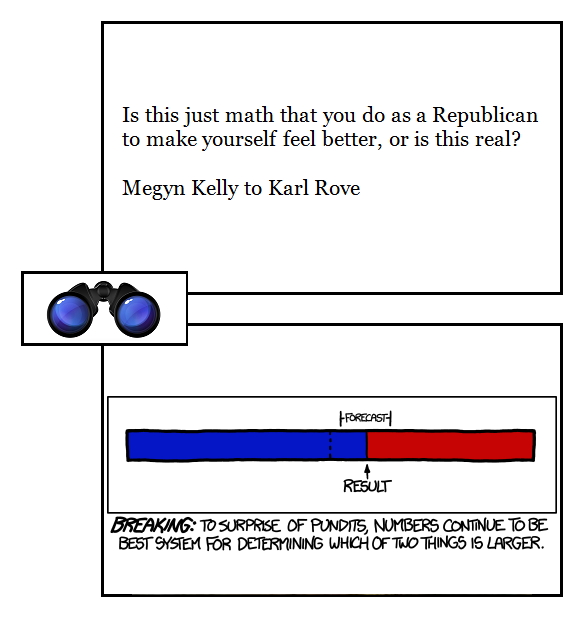 So here’s a little hommage from a Qualit to a Quant — Nate Silver, in this case — with a bow to Megyn Kelly for calling out Karl Rove like that (upper panel, above), and a tip of the hat to xkcd (lower panel) for the usual spot-on commentary from his “webcomic of romance, sarcasm, math, and language”. Ah — but then, what should we do with Colbert‘s comment? Joking aside, one reading I’d add to Zen‘s post-election list would be Zeynep Tufekci‘s In Defense of Nate Silver, Election Pollsters, and Statistical Predictions.